The Book Pipeline Spotlight articles cover novels, non-fiction, and other published works that we feel deserve adaptation for film and television. Know of a story that’s flying under the radar you’d like to see adapted? Email us. Ironically, when it comes to originality, you’d be hard-pressed to find it in the fantasy genre. Virtually every permutation of a world-ending war, quest for a a lost princess, usurpation of a throne, or a Chosen One saving the world has been done to death. Kaz Brekker, an infamous thief, is promised a very large sum of money to rescue scientist Bo Yul-Bayur from the dreaded Ice Court. Bo Yul-Bayur has discovered jurda parem, a lethally addictive drug that greatly enhances the powers of the Grisha, a fighting force of people with magical abilities. However, the Ice Court is the most highly protected place in all of the world, and Kaz can’t infiltrate it by himself—he needs a crew. He recruits several members of his street gang, the Dregs: Inej Ghafa, a nimble and stealthy spy whom Kaz rescued from a brothel. Jesper Fahey, a sharpshooter with a penchant for gambling. Nina Zenik, a Grisha Heartrender, with the ability to control the bodies of others. And lastly, Wylan Van Eck, a merchant’s son with some skill at demolition. The task isn’t easy, so in order to win, they’ll need to work together and trust in each other. Strong concept, diverse cast, and a magical twist? Sign us up. Even if you have no former knowledge of the Grishaverse—Bardugo’s greater canon, and the universe this story is set in—you can still enjoy this pulse-pounding fantasy caper. Despite the large character count, twists and turns, and extensive universe-specific nomenclature, the story itself is simple. Put together a crew, rescue the scientist, prevent him from making drugs for an evil force, get paid. All this makes for an easy jump to a three-act screenplay. You’ve got the clear goal: rescue the scientist. You have the stakes for each member of Kaz’s crew: get the money, escape past mistakes. And you have the striking visual potential inherent in a fantasy world. But it seems we’re not the only ones who have set our sights on the Grishaverse. Bardugo’s flagship novel, Shadow and Bone, is in development by Harry Potter alum David Heyman at DreamWorks. They acquired the film rights in September of 2012, but have yet to formally announce a release date. This installment follows a young woman named Alina, who can harness the power of light. She becomes a target when her latent power is revealed and is hunted down by the powers that be. Arguably, for a film, Six of Crows could be the better source material of the two. A persecuted young adult with powers beyond their control is yet another one of those common fantasy narratives we’ve seen over and over again. A fantasy heist? 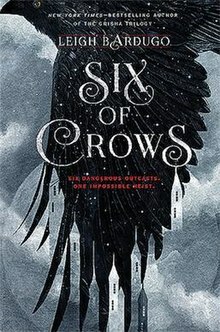 A rarer beast. . . . On top of having a stronger story, Crows is also the first of a duology—followed by Crooked Kingdom, which follows the aftermath of the heist. If it was a franchise DreamWorks was after, they could have their cake and eat it, too. At Book Pipeline, we’re constantly trying to find that fresh foray into a familiar genre. We love seeing broad and diverse casts, well-developed worlds, and a healthy dose of fun. As such, we’d love to see Six of Crows adapted to film. Brianna Janes is a writer, reader, competition judge, and freelance story analyst. She has placed in several contests, most notably as a finalist in the 2016 Script Pipeline TV Writing competition. Starting as a reader in her freshman year of college, Brianna has read over 10,000 scripts in the last six years. She has consulted at CAA, worked in development at NBCUniversal, and has found a home at Pipeline Media Group.